crazy driver out of control. I kept on going as if nothing had happened and I started my day meeting with a student who needed extra help. I heard deep down inside “This is what I do.” The Lord was reassuring me telling me that He had saved me beautifully and so naturally the way He did. That is what He does. He saves us from bad situations. We are aware of it at times but most of the time we have no idea what is going on backstage. We live our lives on the stage of our lives and there is commotion and tension backstage that the Lord takes care of. Sliding on the ice was no fun but peace was on my side and it made me feel in control even though I had no way of stopping the car. That is what the Lord does. He keeps us safe and He can give us peace even when we are sliding out of control and we have no way of stopping. What we have to do is keeping driving knowing that the Lord is in control. Psalm 46 is a great psalm that deals with the Lord being our refuge. I had read it that morning before going to work. I had also heard “Don’t worry. Do not be afraid” during prayer time that morning. As a matter of fact, I have been hearing those comforting words a lot lately. That is what the Lord does. He comforts us before the drama. He sees us through the drama and He turns it into a blessing. It was a blessing to experience so much peace in the middle of a bad situation. The Lord is a calmer. That is what He does. I flew to Paris last night for the long weekend. The plane went through several zones of turbulence. It was very bad. It was “people-screaming” bad. I have to admit that my body reacted to the turbulence and I started to shake a little bit. Then I heard deep down inside “Do not worry. Remember it’s going to be fine.” As comforting as those words were, the turbulence was shaking my faith but I put on some praise music and a sense of balance invaded me again. Peace showed up and I sat there grounded in the love of the Lord. That is what the Lord does. He wraps us in His love and keeps us safe and loved. I have been touched by how caring the Lord has been. That is what He does. He cares all the time. We need to embrace His care all the time. When there is bad turbulence, turning to Him for comfort should be our first resort. Fear will try to grab us but if we let the Lord overwhelm us, peace is what we will have. Why? Because that is what He does! This message is always bubbling up in my spirit. I can’t ignore it and I can’t suppress it. It is so real that I feel like it is tangible. There is always hope with the Lord. The message of hope should be repeated and shared. Nothing can stop the Lord from doing what He promised He would do. One of His promises is that if we have faith, He will always come through. With Him there is always hope. Jesus is not the Lord of maybe or possibly. He is the Lord of “Yes, there is always hope”. Don’t rely on the assumption that hope died with yesterday. It is present today and it will be alive tomorrow. There is always hope no matter what you are facing. Jesus is hope and He will always be around. Yes, you will always have some trials or tribulations but you will also always have Jesus who destroyed trials and tribulations on the cross. When life serves you a dose of problems, remember that Jesus can serve you a dose of relief and peace. He will give you a double portion. He will give you twice as many blessings for each curse and each bad circumstance. If you are at the point where you think that nothing will change or that hope is lost, I am here to remind you that hope is alive and well because Jesus is alive and well. Our minds are so powerful. We can think and imagine things that don’t exist or that will never happen but because of the power of the mind, we believe they are happening or they are going to take place. Our minds make us believe and make us doubt. If our spirits are not built up or if they are going through a weakness phase, our minds will reign and control our belief system and our faith. The Bible says that if we believe that the Lord has answered our prayers, our prayers will be answered. Now the opposite is true. If we believe in the negative, the negative will come to pass. Having faith in the wrong things can be as powerful as having faith in God and His promises. When we keep thinking that hope is dead and believe that it is truly dead and all we experience in our lives is misery. Hope needs to be fed. It needs to be nurtured and it needs to be taken care of. Keeping hope alive is very crucial. Without hope we have nothing. Hope and faith go hand in hand. Now think about the incredible trio of hope, faith and love. Those three combined, form an invincible force. I want to invite you to keep hope alive and do what it takes to maintain it. This might mean staying away from venues and sources that steer you away from hope. You might need to avoid spending too much time with negative people. I am not saying you need to cut people off but until you find hope again it is important that you stay away from negativity. It will only make things worse. You need time to build up your hope muscles and they won’t grow if you keep getting hit by heavy weights of doubt, fear and confusion. The best way to see hope increase in your life is to keep focusing on Jesus the King of hope. Read about Him in His Word, pray to Him, celebrate Him every day, stay with Him and you will experience an enlargement of hope in your life. Jesus will never, ever tell you that there is no hope. Take it from the One who knows it all. There is hope for you today, tomorrow and every day. Stay encouraged! Have you ever wondered what the meaning of Christmas was? To many people Christmas is a commercial holiday and it is a reason to show they care for others. For many people Christmas is a stressful time because of all the shopping, the cooking and all the relatives getting together in one room. To some people Christmas means a yearly visit to church. Some people see it as sad time because they have no one to spend the holiday with. Some people promote Santa Claus way more than they celebrate Jesus. Jesus is the reason for the season. He is why we have Christmas in the first place but He is way too often the last one to be celebrated on that day. Gifts and big dinners have taken up the throne of Christmas. Stress and anxiety pay a yearly visit to many people during the holidays. Christ has been ousted from Christmas and the holiday has lost its original significance. Today I want to encourage you to give yourself the best Christmas gift ever. Revisit the reason behind Christmas and spend some time honoring the One who gives meaning to this holiday. Focus on the Christ part of Christmas and minimize the commercial side of Christmas. It’s not about the gifts but it’s about the biggest gift given to the world. When Jesus was born, a new window was open. A window that let in hope, peace, joy, love into the world and that led to the path to salvation. For God to come to earth in the form of man is an amazing miracle that shut the door on the enemy. Jesus coming to earth was the beginning of the end for the enemy. The enemy got so agitated that he tried to kill Jesus as an infant but the Lord demonstrated that nothing could stop His plan and that the enemy wasn’t greater and stronger than He. Jesus being born on earth is a tremendous gift from God. It marked the reconciliation between God and humanity. It bridged the gap between God and men and it illuminated the world with hope. Christmas symbolizes hope coming to earth. It symbolizes the start of the victory over death. It represents the beginning of a new life and the fulfillment of the promise of salvation. The symbolism of Christmas alone is a good reason to celebrate the One who came and died for us so we could have eternal life. Shouldn’t Christmas be a big celebration of the Lord? I am not advocating changing the whole gift exchange idea and the whole family gathering concept. I am just in favor of adding to it by making Christ more important on that day than most of us do. How could you recognize the importance of Jesus’ birth today? Some would say that going to church is enough. Some would say that praying on that day is enough. However, we can have church every day at home and prayer should be a habit in my opinion. A beautiful way to recognize His importance today is to receive Him as if it were the first time. Go back to the excitement of receiving Him and lift Him up higher than ever. Use Christmas as a starting point to magnify Him every day. Use today as a reset button and reset your dedication to Him. Give Him the gift of your attention. Give yourself the gift of adoring Him like you never have before. Spend time alone with Him today. Merry Christmas to you and happy Jesus celebration! When we hear something pleasant we often say that it is “music to our ears.” The voice of a loved one can sound like music to our ears. What does our voice sound like to God? We are His loved ones and I am sure that our voices sound like music to His ears. I am not sure that the music is always that pleasant depending on what we say but He loves us anyway. If what we say is a song or music, let it be a song of joy, a song of victory and a song of love. Let the music that the chain of our words make, be beautiful music to God’s ears. We sing too many songs that are depressing and that are even heart-wrenching. It’s time we made our songs a celebration of the One we love. It’s time our songs echoed God’s presence in our lives. We need to stop magnifying the negative with what we say. We need to stop singing the blues and start sing praises with our lives. I want to encourage you today to fine tune your words and turn them into lyrics of a song dedicated to the Lord! I used to like songs that made me feel so melancholic. I was addicted to sad songs and it took me a while to realize the negative impact they had on my thinking and on my life in general. I listened to them too much and their pestering message would go straight to my heart and mess up my spirit, my mood and my emotions. Now, think about what happens when what we say is always negative. Think about the negative song we project when all we say is depressing, pessimistic and void of joy. Those words end up impacting our hearts and they create emotions that keep us in a state of chaos. Internal chaos is dangerous because it festers and then it explodes and it causes problems. What we think about we often end up saying and what we say often dictates our actions. Singing a positive song with our words can help us develop a positive life. The Lord wants us to be joyful and to have peace and He tells us in His Word that all the joy and peace we need is available and it can be activated by what we say. Why not sing a good song then? A song of love and a song a victory is what we should have in our minds and in our hearts. Those songs can change the atmosphere. They can transform our moods and change the course of our days. I start my days with a positive declaration during prayer time. 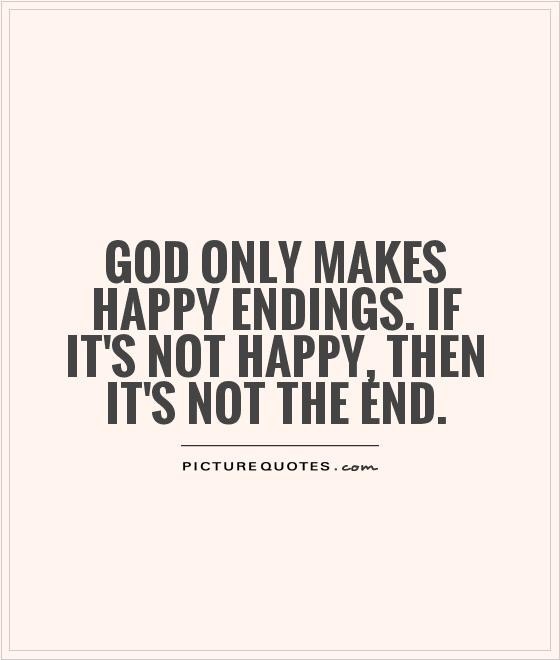 I state all the good things that are going to happen that day based on God’s promises. I thank Him for His blessings. I thank Him because something very good is going to happen that day. I say that no weapon formed against me is going to prosper. I claim that I am highly favored and that the Lord walks with me all day long. I am not alone and I want my circumstances to hear that. I want them to hear that I am backed up by God Almighty. I want my thoughts and my mind to hear that there is an unlimited amount of love from the Lord and that I have the victory in Jesus’ name. I let my words express those songs of love and victory as much as I can throughout the day. Do it! Sing your song of victory today. It doesn’t matter what is going on in your life. Your song is music to God’s ears. Celebrate His triumph all day. Show Him how much you are in love with Him with what you say. Sing a good song today! Comfort food is food that gives consolation or a feeling of well-being. Yogurt is one of my favorite comfort foods because it brings back good feelings from childhood. Comfort food takes you back to a familiar place that you love and cherish. It makes you feel at home. Most people eat their comfort food in order to deal with painful and tense situations. The Word of God is food for the soul and it is nourishment for our whole being. It is a huge supply of food that we should be having every day to maintain a healthy (spiritual) lifestyle. 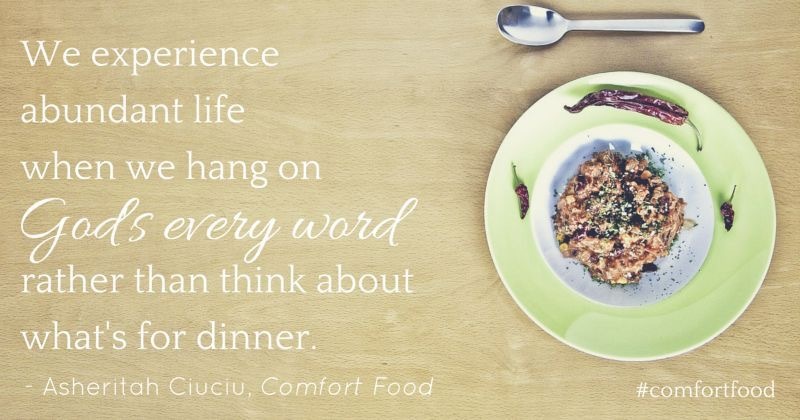 We can find some delicious comfort food in the Word. We can find passages that take us back to a familiar and safe place. What is your (Bible) comfort food? What passages do you turn to when you need to feel at home again while going through an uneasy time? Let me share some of my comfort foods . 1. The ice-cream of consistency: “Jesus is the same yesterday, today and forever” (Hebrews 13:8). This comfort food is my to-go food. I snack on it the most. I take it out of the fridge of God’s provisions every chance I get. The Jesus who did great things for me years ago is still the same. He has the same love, He keeps the same promises and He has the same power. As I indulge in this comfort food, I find the strength I need. It gives me spiritual energy for the rest of the day. 2. The calming dessert: “The Lord is my shepherd. I lack nothing. He makes me lie down in green pastures, He leads me beside quiet waters, He refreshes my soul.” (Psalm 23:1-3). This comfort food brings a lot of peace. It encourages me to get into meditative prayer and it soothes my mind, my soul and my spirit. God is the ultimate provider for all things. Eating this food daily is a great reminder that I have nothing to worry about. He will always meet my needs. 3. The hearty snack: “And now these three remains: faith, hope and love. But the greatest of these is love.” (1 Corinthians 13:13). This snack always satisfies and it covers all food groups. It will sustain you for a long time and it will keep you in the truth. Eat it at all times. Don’t ever worry about overeating love. It’s the key to everything. I strongly encourage you to define your comfort foods and to indulge in them. They will bless you every time. Eat up! I don’t know what’s going to happen this week. I don’t know if there will be acts of terrorism or casualties. I don’t know if you are going to have your heart broken or you are going to run into difficulties. What I know for sure is that God’s mercy will be enough for you and He delights in showing mercy. I know for sure that you will have what you need to face the challenges that will come up. I know that you are going to go through this week with the necessary equipment to have a great week. 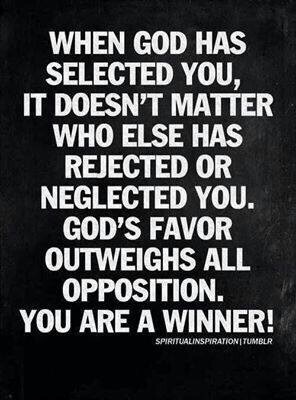 I also know that since God is on your side it doesn’t matter who is against you or what is against you. Romans 8:31 puts it nicely. It says “What, then, shall we say in response to these things? If God is for us, who can be against us?” “These things” refer to all adversity, the opposition, problems, conflicts and all negative things. They will come. They will happen but it doesn’t matter because we have Someone greater and stronger for us. He is on our side and He is rooting for us. “These things” won’t win. You will win. I am not making negative predictions by alluding to the fact that “these things” could take place this week. If we think that nothing bad will ever happen, we put ourselves in a very vulnerable position and we stick our head in a bubble outside of reality. Once I understood that “these things” are bound to happen it actually made me feel better. Once again I have to say that I don’t go around expecting bad thing to happen. I go around with joy and confidence that no matter what happens I can handle it and I will go through it with flying colors because of the One who is for me. If you adopt the same attitude, you will live a lighter life and you will have a more constant positive outlook on life. Just hold on to the truth that God is for you. If you get sick, God will still be for you and He will help you. If you get bad news, God will still be for you and He will help you. If you get hurt physically or emotionally, God will be for you and He will help you. “These things” could be the worst things you have encountered BUT God will be for you and He will get your through them. Since God is for you and He always says you have nothing to worry about, enter this week with the assurance that you indeed have nothing to worry about. Keep in mind that you are in good hands no matter what bad hand life deals you this week. You are living in the truth and the truth is that blessings and favor will follow you every day this week. You are going to be a blessing to people around you and you are going to encourage those who need encouragement because that is part of who you are whether you know it or not. This week is going to be very good because it is what you can expect. Expect to be surrounded by mercy and grace. Expect to bounce back when you get punched by the opposition. Nothing that happens to you this week can stop what God has planned for you. His goodness is going to be present. His wisdom is going to dawn on you. His love is going to walk this earth thanks to you. Stay encouraged and praise Him for what’s to come. The good will be sustained, the bad will be dealt with beautifully, and the ugly will be beautified. Have a great week! No one would deny that the atrocities taking place in the world have affected a lot of us emotionally. Pain and sadness seem to be a commonplace wherever you go these days. We are not immune to sorrow but we can take the necessary measures to deal with it. My proposal today is to take a break from the pain. Take a break from the sadness. “How?” you may ask. Have a fun. Have a party. Attack sadness with joy. Joy is a strength that can restore us from sickness to health and that can boost our morale when we tap into it. I am not saying this is easy to achieve but I am saying it can be done. Nurturing sadness will allow it to grow into something even more devastating. Cultivating joy will enable you to face the harsh realities of life with power. There is tremendous power in joy and it’s time we excavated it. Having a relationship with God implies having access to unlimited joy. Too many people are not aware of that and think that staying sad is pious and most accepted by God. No, He is not a sad God. Sadness is not in His DNA. It shouldn’t stay in ours for long. Let’s kick it out of our system! I understand that having fun while everything around us is falling apart sounds like a bad idea. However, some popular bad ideas are what we should follow. If we want to start thinking the way God does, we need to let go of some of our old world patterns of thinking. When God advocates for us to rejoice at all times He is also including difficult times. Rejoicing when all is going well is no big achievement. Rejoicing when pain is eating us inside is a great testimony to our faith and trust. I have a friend who is always happy. Even when he gets bad news he bounces back very fast. He doesn’t believe in God but he knows the power of joy. He knows how much positive energy comes from joy and how it affects him in a wonderful way. I suggest you jumpstart joy. Do something fun. Watch a comedy. Read some jokes. Hang out with happy people. Give joy a chance to make an entrance into your life by finding it in the small things first. Once you have connected with it again, it will take off with wings if you stay open to it. There is a huge supply of joy waiting for you. God is the supplier and you are the receiver. Joy has a way of eradicating sadness and pushing it out of the way. We have a choice. We can pile up the dirt of sorrow on ourselves and be buried under a mountain of pain or we can dig ourselves out with joy. Like I said earlier, having a party in the face of adversity is a good choice. Instead of having a self-pity party we ought to have a happy party. If nothing else it will help you forget the pain for some time but I can guarantee that it will do a lot more for you. Take a break from the misery around you and spend time with the One who can heal all wounds. The more happy times you engage in, the stronger you will get when faced with sad moments. We can’t help feeling sadness but we can help ourselves get out of it. “Rejoice in the Lord always; again I will say, rejoice!” (Philippians 4:4).